I know my words cannot do justice to the week we spent at the U.S./Mexico border, so I figured I might as well start with someone else’s. This was said by Mark Adams, one of the coordinators for Frontera de Cristo (Christ’s Border), upon our arrival in the border town of Douglas, Arizona. Our first stop in Douglas was the wall, a towering 23 foot structure that plunges 6 feet below the ground as well. The wall is constructed of tall metal bars spaced far enough apart that border patrol agents can see what’s happening on the México side. Mark asked us to go around and share what we have heard people in our hometown area say about immigration. It turned into a political analysis, with many of us citing our own family’s left-leanings in contrast to our town’s more conservative politics. We thought we knew what we were talking about: liberal=pro-immigration, conservative=pro-wall. It turns out it is way more complicated than that. The wall has been a bipartisan effort for a while now, starting back in the Clinton administration. The wall is 23 feet tall in the town, but out in the desert it peters out into a low vehicle barrier. The Clinton administration hoped to use the lethal deterrent of the desert landscape to lower the rate of illegal immigration. It was lethal, but it wasn’t a deterrent. I’m trying to wrap my mind around the fact that our country’s official policy is that we would rather have migrant people die in the desert than live in our country. We spent the week crossing back and forth between Douglas and its sister city, Agua Prieta, México. 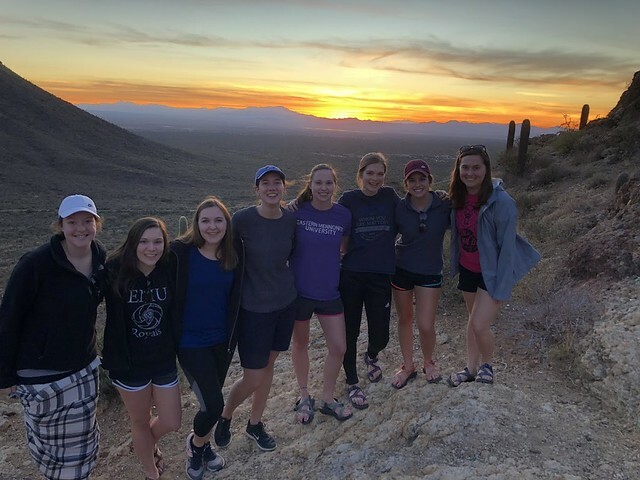 We stayed in a church on the Agua Prieta side, and spent our days visiting people, the desert, the wall, listening to stories, asking so many questions. We spoke to a woman who was held in detention for three months, unable to communicate with her children or even know if they were okay. She was pulled over for speeding and didn’t have her papers. We learned about what the migrant people are fleeing from: gang violence, economic ruin. We learned that people wouldn’t leave their homes if they didn’t have to; and we learned about our own country’s hand in why many people feel like they have to leave. One small example: In the 50s Guatemala had a democratic election and Jacobo Arbenz won. He began to institute land reform, which basically meant he was giving land back to peasant farmers, land that had been seized by the Spanish conquistadors centuries before. This land reform threatened the interests of the United Fruit Company, which had a monopoly on Guatemalan land and profited off the cheap labor of the Guatemalan campesinos. So the CIA encouraged and backed a coup d’etat by the Guatemalan military, toppling Guatemala’s democracy and plunging the country into nearly three decades of military dictatorship. The director of the CIA at the time was Allen W. Dulles. Dulles was also, coincidentally, a board member of the United Fruit Company. It has been really painful to realize the lengths my country has gone to in order to ensure our global economic dominance. And then we wonder why we have a refugee crisis on our hands? But why don’t these immigrant people just come legally? We spent a lot of time hearing about our immigration system, and if I learned one thing, it’s that it is a convoluted mess. It can take years and years and hundreds of dollars to hear back about a visa application- and chances are it wasn’t granted, anyways. And if your son has been threatened by a gang or you don’t have a job to feed your family, you aren’t going to wait around and hope for the best. Our group attended a prayer vigil one cold evening. We marched down the road, holding white crosses with people’s names and the date they died in the desert, looking for a better life and not able to find it. It was incredibly powerful to say each person’s name aloud, claiming them as a person, praying for their family. My personal physical discomforts piled up: I couldn’t feel my toes, my fingers were turning purple, I had to pee, I was hungry, I was tired. But that just helped me channel my prayer to the migrants and their families, somehow. I guess it was because my discomforts of the moment were so much less than these people experienced as they died crossing the desert, striving to reach this promised land that I was born in. Another thing we experienced this week: kindness. I felt such incredible hospitality everywhere we went. So many people hosted us in their homes for meals, telling us that their home is our home now. On Friday, after five days of immersing ourselves in trying to understand the struggle of the migrant, we visited the Border Patrol station in Douglas. We heard a lot of disheartening jargon thrown around; the agents kept referring to the migrant people as “illegals” or “aliens.” Both of the agents we met called their job “adult hide-and-seek” and eagerly told us about the toys they got to play with (read: military grade technology). It would have been pretty easy to demonize the Border Patrol agents after the week we had. But the point of our visit was to humanize them, to remember that there are human beings on both sides of the border. One Border Patrol agent also told us about a 14-year-old girl he found wandering in the desert, on the brink of death by dehydration. He saved her life. They also told us about all the drugs they find and confiscate. While the vast majority of the drugs entering the U.S. are smuggled through legal ports of entry (about 70%), Border Patrol agents do still stop a lot of drugs from entering the U.S.They also deport desperate migrants trying to get a job to send money back to their children. In one of our readings for this week, a deported migrant said: “I don’t blame la migra. 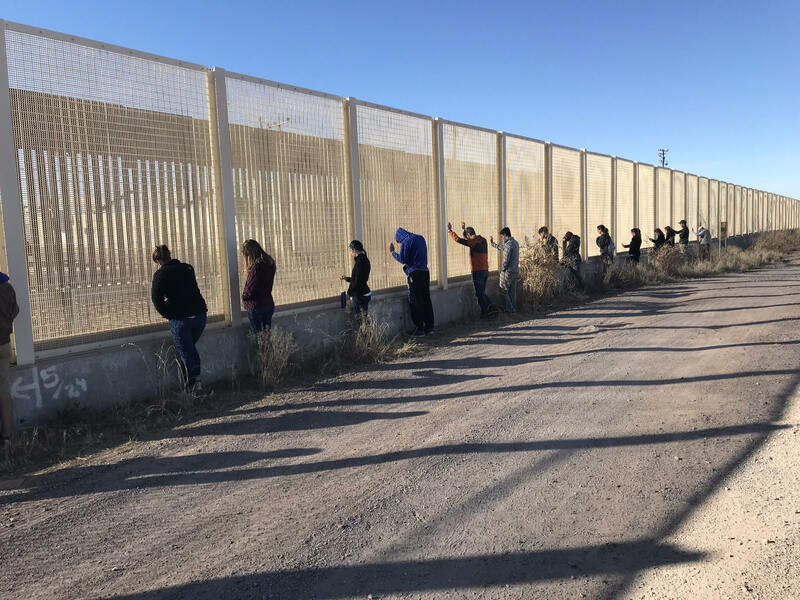 They’re just doing their jobs, enforcing the laws that come from above.” Someone from our group said, during our lengthy reflection after the Border Patrol visit, the Border Patrol is a symptom of the problem, not the problem itself. We did encounter an organization this week that is addressing (one of the many) problems itself. It is a coffee co-op called Cafe Justo (Just Coffee) that is owned and operated by coffee farmers. This ensures that the coffee growers earn a fair wage for their work- they can earn up to 15 times what they get when they sell to coffee corporations (like Starbucks!). And when they are able to earn a living wage, they aren’t forced to migrate. Also the coffee is delicious. So it’s a win-win. I highly suggest ordering some online. If I learned anything this week, it’s that the border is a complex and beautiful place, and each person affected has their own truth to share. I hope all of you have the chance to visit our nation’s border someday. To see with your own eyes the beautiful ragged landscape. To hear people’s stories for yourselves and come to your own conclusions- or your own lack of conclusion, because that’s where I am right now. I just know I want to come back soon. On the other side of our wall sits a town called Agua Prieta, Dark Water. Brightly painted stucco buildings are stacked cozily along the streets, their signs faded and sagging with disrepair. Dogs wander the dusty, trash-strewn streets, and windows and doors gated with intricate ironwork give off an aura of secrecy. The purple silhouettes of the surrounding mountains stand in the distance, past the low roofs and tops of palm trees. In the late afternoon, sunlight glints just above the tops of the mountains, lighting the city in a hazy, golden glow. Inside the secretive houses are drug lords, for sure, but also normal people, just like you and me. People who are trying to do the best they can with what they have been given. People who want a better life for their children. People like Ada, and Carmina and Oscar, and David and Marina, and Isaac, and Joca, and Mark—all of whom opened their homes and their lives to us in a humbling display of generosity. 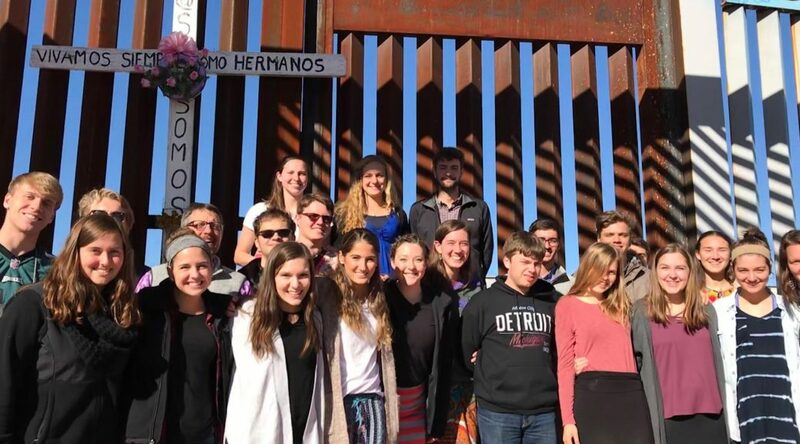 People whose lives tell part of the story of this broken and beautiful border. Agua Prieta. Dark Water. The fountain of life overshadowed by a powerful force which, when angered, can cause great pain and destruction. There is danger lurking here, danger which was not evident to me, a rich white foreigner who felt unthreatened on her early morning runs down the still-slumbering calle 11, but which is much more evident to the people who live and work there. People like Ada, who broke down crying when she told us about the time the cartel surrounded her home. Agua Prieta. What is in a name? A story. A place. A memory. More than political opinions or op-ed essays in the local newspaper. More than this or that, right or wrong, good or bad. It is a place with people, people with real lives and real stories. People whose family members have worked in maquilas, gone to the U.S. and never come back, died crossing the border. People whose joy in life and love for others has touched my heart. In the desert, drinking up the dark water of life, a flower is blooming. A flower in the form of Ada, Mark, Isaac, Joca, Laura, David, Jack, Emily, Cynthia, Daniel, Marina, Alex, Rosalinda, Carlos, Daphne, Ferdinando, and many others. A flower nourished by the work of CRREDA, CAME, Dougla-Prieta, Cafe Justo y Más, and Frontera de Cristo. A flower that is blessing life and bestowing beautiful grace into a divided and fearful land.